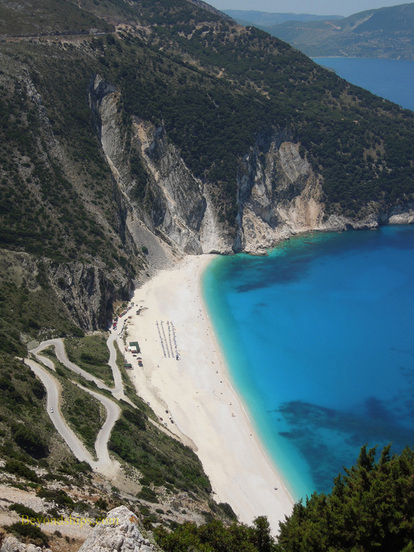 Above: The dramatic beach at Myrtos Bay. 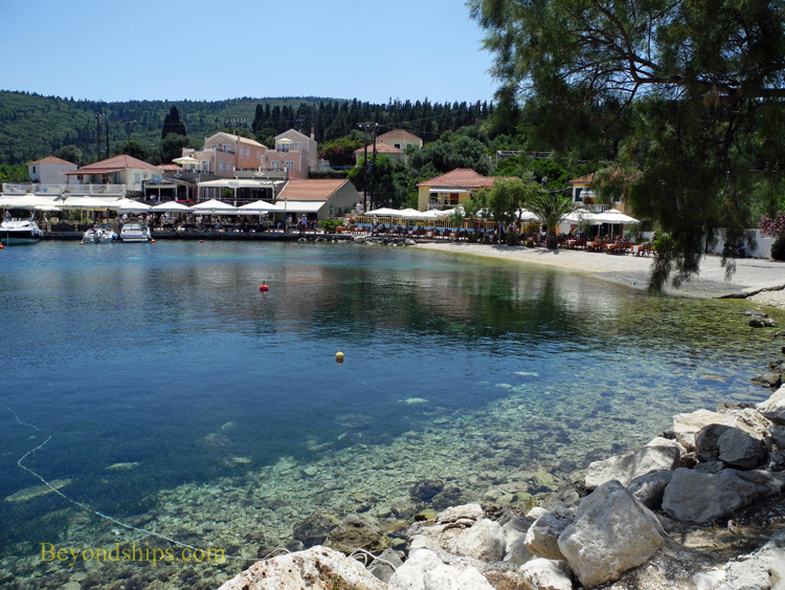 The traditional fishing village of Fiskardo is a favorite of celebrities and yachtsmen. Another highlight of the island is the beach at Myrtos Bay. Consistently voted one of the world's most beautiful beaches, it is a mile and a half crescent of white tiny pebbles and sand. The deep water ranges in color from aquamarine to turquoise depending on the light. But what gives the beach such dramatic beauty is that it is overlooked by high vertical cliffs. Of course, this also makes it something of a challenge to get to the beach, involving a winding road. Speaking of roads, Cephalonia is mountainous and often the narrow roads are cut into the sides of the mountains. This means that the views are often spectacular. However, riding in a coach next to a sheer drop of a thousand or so feet can be an adventure in itself. Further up the road is the village of Assos. Sometimes called “The Honeymoon Village” because Prince Charles and Princess Diana stopped here during their honeymoon, this picturesque village is overlooked by the remains of a 16th century Venetian castle. At the north end of the island is Fiskardo. This little village was one of the few spared from destruction in the 1953 earthquake. As a result, it has the architecture and feel of a traditional fishing village. 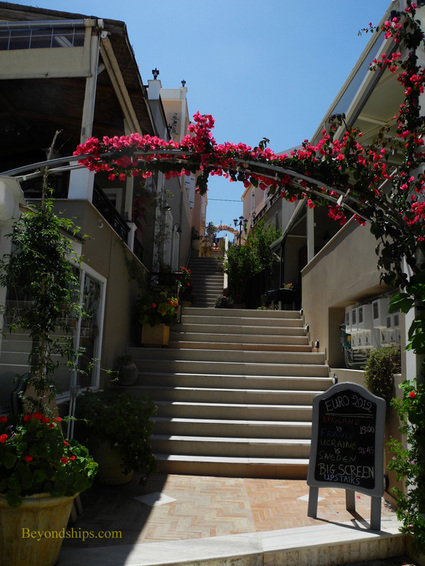 Situated on a small bay, Venetian-style buildings adorned with thick clusters of flowers line the narrow streets. Along the bay, cafes and taverns offer drinks and meals under awnings that protect you from the afternoon sun. It has a timeless and restful feel, no one is in a hurry. 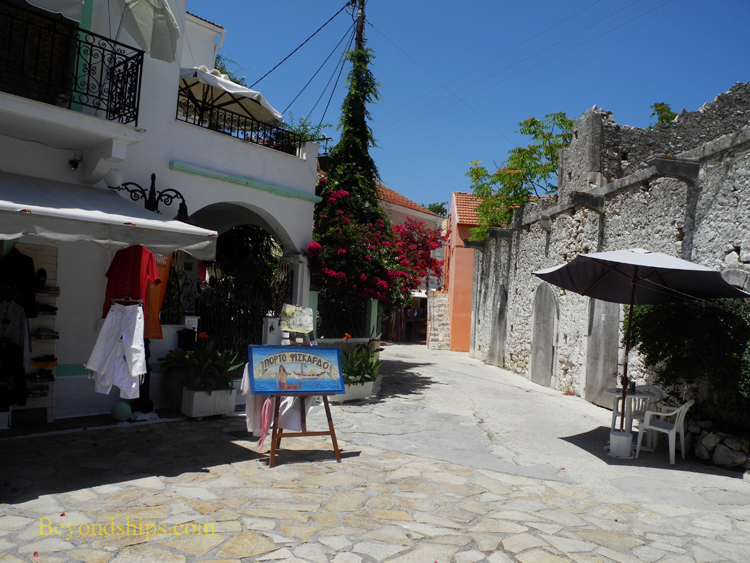 Perhaps because of this, Fiskardo has become a favorite with celebrities who bring their yachts into the bay and then come ashore to explore the shops and cafes. 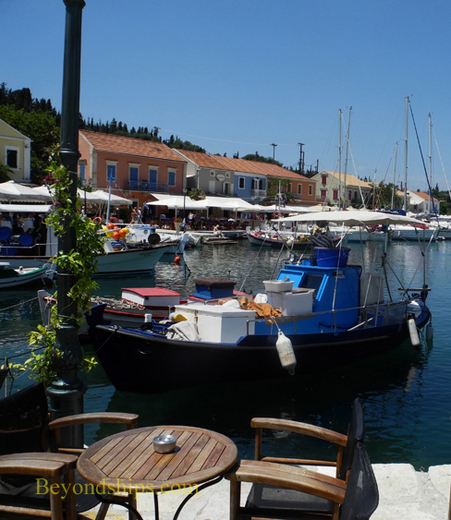 While Fiskardo cannot be called undiscovered, neither is it composed of international chain tourist shops and restaurants. It still retains its authencity and genuiness, which is generally characteristic of Cephalonia. Other attractions in Cephalonia include the Drogarati Caves, the Castle of St. George, Lord Byron's rock, the Monastery of St. Andrew and the re-constucted village of Kourkoumelata.